A modern seaside resort with a wide sandy beach, protected by a breakwater. On its southern side, just along the border between the Romagna and Marche regions, we find Gabicce which, together with its rocky promontory “Conero”, represent the only cliffs dropping into the Adriatic Sea from Trieste down to the promontory of Gargano. Just to the north we find Misano with its famous “Santa Monica Motordrome” which hosts international car and motorbike races. The San Bartolo Park – a naturalistic site interesting also from a natural history perspective; here we find the spontaneous growth of rare Mediterranean species; the small woodland clearings host a typical local fauna and numerous varieties of marine birds (cormorants, magpies, seagulls, herons, storks) and also birds of prey like buzzards, hawks, hobbies, and a few rare fish hawks. Cattolica is called the “Queen of the Adriatic Sea” and its tradition of hospitality has ancient roots. It was certainly a transit and stopping point for those travelling along the Via Flaminia (200 B.C.) and some archeological traces evidence a local economy based on transiting travellers. This reputation for hospitality continued even throughout the Middle Ages. 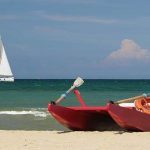 The 1700’s saw the birth a flourishing fishing activity; then, during the second half of 1800, the very first villas and summer residences built by aristocratic and wealthy bourgeois families, following the modern trend “bathing in the sea”. 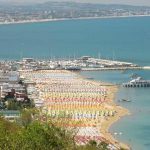 In the 1930’s Cattolica was still an elite resort while in the 50’s and 60’s, it drew mass tourism. Cattolica conserves evidence of its antique origins in the “Museo della Regina”, together with traces of its seafaring traditions. The symbol of Cattolica is the hawsole (an overturned eye, more or less rounded, which was once a traditional ornament used to decorate fishing boats). Don’t miss visiting the interactive marine part “Le Navi” – an enormous aquarium situated inside a children’s summer camp site, built during the fascist period, and which resembles a fleet of ships – an interesting example of futuristic architecture. 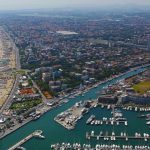 Just a few kilometres from Cattolica, in Riccione we find the theme parks “Acquafan” and “Oltremare“. 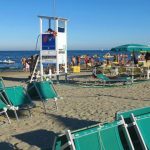 The seafront promenade, the streets and parks are all extremely well cared-for hence, Cattolica, year after year, fully merits the “Bandiera Blue dell’Adriatico” (Blue Flag of the Adriatic) award.